Another Yankees catcher is on his way to Pittsburgh, as Francisco Cervelli has been acquired by the Pirates in exchange for lefty reliever Justin Wilson, the teams announced tonight. The Pirates are getting a catcher who has performed well in limited recent action. Unfortunate injuries — a foul tip and collision followed by a hamstring strain — cut Cervelli short in each of the last three years, holding him to just 225 plate appearances. But he does own a .291/.373/.447 slash in that stretch, and could be a solid piece if he can stay on the field. Because of his limited ability to rack up statistics, Cervelli is projected by MLBTR/Matt Swartz to earn only $1.1MM next year. Wilson, meanwhile, is just 27 and is still a year shy of arbitration eligibility. He took a step back last year in terms of ERA, though metrics like FIP felt he was just as good in 2014 as he was in 2013; both place him in the mid-3 earned run range. On the whole, over the last two years Wilson owns a 3.03 ERA with 8.1 K/9 against 3.9 BB/9 over 138 1/3 frames. Jon Heyman of CBS Sports first reported, on Twitter, that the Pirates had acquired Cervelli, and the New York Post’s Joel Sherman tweeted that Wilson was headed to the Bronx in exchange. So they’re not bringing martin back? He’s not Yankee enough anymore. Can’t imagine much. Maybe a guy middle reliever or low-level outfielder. Probably a relief prospect. Or rookie-ball starter. The pirates love ex-yankee catchers. The Pirates are among baseball’s most advanced front offices. The Yankees place a heavy emphasis on pitch framing, perhaps because they are among baseball’s most advanced front offices. If you believe sabermetric analysis, pitch framing is perhaps the most undervalued skill in baseball. Yankee Catchers (Stewart, Cervelli) tend to be very good at pitch framing. Everyone Pena touches turns into a good pitch framer. Really hope he stays for a long time. What did you get Cash? The Pirates sure love Yankees’ catchers. Good Luck to Francisco Cervelli. Cervelli would be best as a backup. He’s got a good bat so if he had to play full time it wouldn’t be detrimental. though our best prospect is a left handed relief pitcher????? Aaron Judge is a left handed relief pitcher? Gonna be scarry tall pen with betances and Judge. Cashman is all about the cheap relief pitching ain’t he? Worked with Martin and Stewart. Oh yeah i forgot how much of a stud Stewart is. Career .228 BA and can’t throw a guy out to save his life, I’m sure things will continue to “work” with him in your lineup. He’s hit .294 for the Pirates. So, yeah, it worked. He had a perfectly good year as a backup. He’s also been better than average for his career when it comes to throwing runners out. I have no idea where you’re getting that from. Maybe his SF days when he threw out 39% of baserunners while catching a staff that’s notoriously indifferent to the running game? I was a fan of Stewart when he was a Yankee. I was sorry to see him leave. In addition to what you’ve said here, he was also really tough. I know with the rule change it doesn’t matter as much anymore, but he could take a hit at the plate if he needed to. The Yankees have several catching prospects in their minor leagues. Literally nothing about this is true. Cervelli isn’t our best catcher (or even close) and Lindgren isn’t our best prospect (not even close either). So having a prospect who pitches left handed should preclude them from acquiring other left handed pitchers? I think this is a small move with decent potential to help both teams. When the teams biggest problem was the offense and not the pitching the past two years and you already have left handed relief pitching to fit your needs I don’t understand why you trade away more offense. Because they had a surplus of catching and when you make a trade, you get the best player(s) you can in return, regardless of position. In this case, that best player was this left handed pitcher. I’m sure they’ll pick up offensive players as well this off-season. Also, the Yankees don’t have an Andrew Miller–an established, dependable lefty reliever. They have a bunch of guys they are going to invite to Spring Training, in hopes one will stick. There’s no reason to NOT add one more candidate to the list. Also, this isn’t really “taking away more offense”. Cervelli is not going to start in front of McCann. McCann is one of the few valid power bats the Yankees have going forward. Cervelli would only start when McCann needed a day off and really, the difference between what John Ryan Murphy will hit and what Francisco Cervelli would have hit in those few starts is negligible. Murphy might hit better and he’s a better bet to stay healthy. It’s not as if it was a possibility to get Gregory Polanco in exchange for Cervelli. Yankees need pitching. Lot’s of it for the next two years. They’ve got a log jam of old, ineffective, and often injured position players who’s contracts make them impossible to trade. After 2 years they free themselves of Tex and Beltran, and could most likely dump ARod with only one more year on his contract. That mixed with CC’s contract coming off the books and the Yanks can sign any power hitter they want in 2 years to go along with Tanaka and maybe a guy like Lester, Shields, or even Hamels. The Yankees signing as many arms as possible to keep their opponents from scoring more than 3 runs a game is most likely they’re best chance to stay remotely relevant for the next 2 seasons… There only other option is to sign more absurd contracts and drag this mediocrity out even longer. So Yankees traded a backup catcher with a good bat for a reliever with high K/9 but control problems? Not exactly the most spectacular of trades. Making sure he doesn’t have 6 catchers on his 40, and trading Cervi before he gets hurt again. Why because he does well in the 40 games he is capable of playing a year? Murphy is thought to be a better player, and so was romine before he got hurt. Not that it matters they could rid of Romine and still have 4 catchers on their 40. As a Yankee fan I absolutely hate this. As a Cervelli fan I’m happy he’ll finally get the opportunity to start. You’ll like him Pirates fans. Good hitter, but unfortunately he’s injury prone. He was the Yankee’s anti-Boston Howie Kendrick, without him we’re lost. I feel like if a team were constructed of #7 hitters/borderline irrelevant players they’d be undefeated against NY. It feels like he has had a lot of freak injuries. I don’t think it’s poor conditioning or fragility. He got bowled over by Elliot Johnson in an exhibition game, he has taken a few fouls off his bare hand, etc. the yankees are clearly moving on from David “Papelbon Money” Robertson….ha ha. Justin Wilson is a solid left handed reliever. I’ll gladly take that in exchange for Cervelli. Wilson and De Paula… Yankees stockpiling Lefties. Wilson struggles against lefties; look art his splits. His fastball can hit the nineties, but there isn’t much break and he struggles with command on his secondary pitches. At best, he’s a decent middle reliever. Righties hit for .609 OPS off of him. Lefties hit .617. Half the time Wilson will look awesome. The other half, you’ll wish he had options left to send him back to AAA. When he can’t find the plate, he really can’t find the plate. Probably the biggest reason Bucs never pushed for him to be a starter, although that was his original projection. Out of curiosity- have you ever come across a Yankees transaction you didn’t like? Whenever there is Yankees news I see you commenting to commend the move. This isn’t a criticism- I’m a Yanks fan too and I dig your optimism. I can say for sure I was upset in 2012 with letting Martin go. Stewart never was a Starter and that hurt the team a lot. Also when we signed Ichiro for 2 years, instead of Nate Schierholtz. Making that Vernon Wells trade… Terrible. This year we should have signed Morales or Drew from the start of the season. Roberts was old and always injured. Kelly Johnson struck out too much. But I tend to agree with a lot of what Cashman does. I feel he’s a better GM than he gets credit for lately. (Soriano, Prado, Headley, McCarthy, McCann, Ellsbury, Tanaka) moves like that have kept them competing. Yankees would look a lot better these last two years had they been healthy. Not bad. Catcher was getting crowded. JR Murphy will probably get more playing time now. Cervelli was a joy when he wasn’t getting his head broken or something of that nature. He’s an A+ backup and a ok starter if they need it, but I don’t know what he can do if he started for an entire season. I was hoping they’d package him for something more shiny, but I’ll take it. I guess that makes John Ryan Murphy the Yankees backup catcher. lol as long as Romine stays as a backup. I don’t care. He’s our Brendan Ryan of Catchers. They might have to bring Sanchez up sooner than expected. Can he start the year in the minors or is it MLB or released? I won’t pretend to know for sure, but I’d guess that you stay at what level you ended the season on and could then be called-up, optioned, etc from there? That’d place him at AAA where they can let him rot or trade him. I hope that’s true. If he is out of options, he cant be sent to the minors without clearing waivers and depending on service time he can refuse and become a free agent. Even if he was already in the minors? This includes to Begin the season? That’s what I”m asking. I am pretty sure you are right. I remember reading that a couple of weeks ago. I don’t think Romine will be with the Yankees at any level next year. You can usually find a veteran who can catch-and-throw well enough to be a backup. Murphy has a higher ceiling. I think they would rather give him the opportunity. I don’t think Romine is that valuable, to the Yankees, that they’re going to block a player they’d rather have in the majors, just to not lose Romine. If Teix goes on the DL, I could see them moving McCann to first and call up Gary Sanchez, especially if it’s later May and he’s tearing up AAA and splitting the catching duties between Murphy and Sanchez. Justin Wilson actually makes me feel better about this trade. Still convinced Yanks are getting ready to trade Phelps and Warren. I don’t think they’ll trade either of them, let alone both of them. CC–degenerative knee condition, Tanaka–serious concerns about his pitching elbow, Pineda–I’m willing to bet will never make 20 starts in a season, Nova–probably won’t be back until after the All Star break. There are enough question marks, I don’t think they’d trade 2 of the guys who have actually been successful (for the most part) at staying healthy. Martin and Stewart and Cervi, Oh My! Lets see Roth work his magic here, Wilson had a solid year in 2013. I hate wasting Cutch’s prime years with these “meh” players. He shouldn’t of signed in one of the smallest markets in baseball. He knew what he was getting himself into. No, you sign hoping to win. Believing the organization will build a championship around you. Cervelli’s a good player if he can stay healthy. If they can’t bring Martin back, that means they have that much more money to invest in 1B and the rotation. I’d wait to see how the offseason plays out before criticizing. You are right. Instead of going for it all in 2013, the Bucs did the correct thing by waiting for the prospects to be promoted. Flip that switch. Its a minor trade that gives the Pirates some depth at a position they need it and the Yanks deepen their pen, nothing to over analyze. Someone is gonna drop a contract on Martin that the Pirates cant/wont touch. Every team has at least a couple “meh” players on it. John Ryan Murphy has probably moved past Cervelli in terms of development anyway. The Yankees likely realize that a Teixeira/McCann platoon at 1B/DH is inevitable with Murphy catching. a southern American chef and humorist known for his brand of Cajun cuisine-inspired cooking and humor and storytelling. … and he likes Ruffles potato chips. Who’s gonna be the Yankee backup catcher? 1) I quess the scouting department isn’t confident in Tony Sanchez. 2) In limited playing time, Cervelli shows good discipline. 3) I’d still like to see the Pirates get another reliever to support Melancon and Watson. Sad to see Cervelli go, but honestly either he or JR had to be moved. Not necessarily. JR could have started in the minors and Cervelli would have been the backup C to McCann. Sanchez is ready to start at AAA. They can’t start Murphy AND Sanchez starting at AAA. Great move for the Bucs, if only because it suggests that they finally realize that Tony Sanchez is a “never-will-be”. Justin Wilson was scary good at times in 2013, but tended more towards just scary in 2014. Lots of walks and falling behind in counts, especially starting innings for some reason. He could help the Yanks bullpen, but the Bucs can do without him. And IMO, this means absolutely nothing on the Russell Martin front, but it doesn’t hurt to add depth just in case. they yankees gm knows there aren’t catchers available right? Yes. Which is good because we don’t need anyway. In fact, we still have catchers to spare. You can always find back up catchers. Stewart and Cervelli gave me nightmares in 2013. I have no idea what Neil Huntington was watching. This may sound completely crazy, but I wonder if this doesn’t have something to do with A-Rod’s return. LIke it on both sides. Bucs get at the minimum a solid back up. Cervelli has shown a ton of ability over his major league career, if he could just stay healthy he has the talent to be an above average starting catcher. As for the yankees, signing DePaula today and then trading for wilson tonight signals they’re backing away from Robertson and looking to solidify the bullpen in as many ways as possible. Likely also means they’re about to allocate that money elsewhere (Headley or McCarthy within the next week). EDIT: Maybe this allows the bucs to swing a trade for a lefty platoon partner? Maybe Castro from Houston since they just traded for Conger. Maybe. On the other hand, left-handed relievers is a real need for the Yankees. Who did they have? David Huff? Anyone else? So outside any possible guesses of what it may indicate about Robertson, this was a need that they needed to fill regardless. Thronton until he was traded. They have Lindgren rising quickly and another relief arm or two in the high minors if I’m not mistaken. I am going to miss Wilson so much. He was pretty dominant in 2013 (so much that they considered converting him to a starter or closer) but struggled in 2014. He could be a great late-inning guy if he rediscovers his control. Big guy, smooth delivery, high velocity. Plus he’s a lefty. I’m assuming this puts an end to bringing Martin back. Word is Martin could get a deal around 5-years and 75 million. In my opinion, it would actually be a good idea for a team like the Pirates to skip out on a contract like that for a guy who will most likely start declining. Is it just me, or do you think the Pirates could have gotten a better deal or more for Wilson? Not if anyone glossed over the stat sheet and actually watched him pitch. In 2014 he went from having a solid future as a projected late inning guy to someone you couldn’t trust to hold a lead. Umm….Pittsburgh, from painful, painful, PAINFUL experience, we can tell you that Stewart + Cervelli are not a substitute for a real starting catcher. It looks like we are willing to bypass offense for decent defense, although Stewart had a decent year at the plate in 2014. I’m hoping the savings can net a few pitching upgrades. Chris Stewart is meant to be a back-up. He wears down in just every aspect of the game when he has to play every day. Case in point, even though the Yankees were essentially out of the play-off pictures in September, the Yankees went with John Ryan Murphy the last month of the season. Can’t imagine the Yankees would have any interest in Alvarez. I wouldn’t. That short porch in RF makes him at least interesting for the Yanks. Granted, he was bad defensively 2014 at 3B. A case of the yips that can be overcome is best-case scenario going forward… But he can play 1B and DH at the least. He has played solid 3B in past seasons and can spot the OF corners. I think new scenery and mates would potentially revive the power bat he has shown. Why in the world would the Pirates want to trade Watson and Harrison for unimpressive/average players? Which will give the Bucks a solid back court. I guess the Yankees won’t be signing Andrew Miller then. Long time Yankee fan here…Pirates got a great backup catcher that can be a starter on a small market team. As a backup, he is definitely valuable. Clutch hitter, he has speed for a catcher and his defensive and percentage of catching base runners is good. He is still young, has a lot of emotion and passion…great rally type guy and awesome clubhouse presence. Pirates defintely got the better of this deal and it surprises me the Yankees did not hold out on Cervelli, to package him in a bigger deal to trade for a short stop or pitching. Not liking this move at all..but Pirate fans will be happy. Please define what a big market catcher is and the benefits. I guess this means that the S. Perez (KC Royals) types are not suited to play in NY, Bos, LA, Chi, Phila? I have watched Cervelli his entire career in NY. Simply put he is not a starting catcher for a big market club like NY, Boston, LA etc. He is a career backup catcher that is a great pickup for any team as a backup and for smaller, more moderate teams that have a history of not spending big to acquire talent, usually small market teams, he could be a starter. agree… I’d be stunned if the Bucs sign Martin. Let’s see how the FO spends the saved (unallocated) $$$ before we are too critical of this trade. I like this trade based of the recent success the Yanks have had with relief pitching. Boone Logan is one of the best examples of a guy who went from a lefty with good velocity but no control to a solid late inning reliever in a Yankee uniform. Justin Wilson has plenty of upside. If Dellin Betances proves anything, it’s never too late to hit your stride. If Wilson bounces back to his 2013 numbers, this trade is a steal. My thought exactly… Cervelli was one of my favorite players to watch play, he has so much heart, energy and thoroughly loves playing the game. I hope he gets a real chance and can stay healthy in Pitts. Murphy will be a good backup as long as he gets some regular ABs, which he shoudl since I expect McCann to play a decent amount of 1B. Don’t like it at all. Justin Wilson was a lefty who could hit 97. Can’t believe they gave up on that for a back-up catcher you could literally get for a player to be named. Oh well, looks like the Bucs catching platoon is set for next year. I await the team’s typically disingenuous PR release, “We went way beyond our comfort zone for Martin but simply couldn’t compete with team xyz” when they lose Russell despite payroll being $30-40 million under what it should be. Its a shame we’re stuck with an owner who values profits over seizing his best chance to win ever. As a Pirates fan, I am not a fan of this trade. Cervelli is far from a proven commodity and comes with enough baggage to fill the trunk of an Oldsmobile. Injuries, migraines, drug issues. In turn, the Bucs trade away a 27-year old, 97-100mph throwing, left-handed relief pitcher who is still a full year away from arbitration. In other words, the EXACT type of player the Pittsburgh Pirates need on their roster. Wilson had a down year in 2014, but anyone that watched him pitch in 2013 knows that when he is on he is a legitimate closer-type reliever. The Yankees got a steal in this deal, trading from a strength and acquiring a young arm who will immediately become a quality 7th-8th inning option for Girardi. Happy trails Justin Wilson, and good luck in the Big Apple. We are all sorry to see you go in Pittsburgh. You do realize how unreliable Wilson was for us right? Yeah he had a bad year, but he most of the runs he gave up were giving up leads. It was painful to watch him pitch because I love him to death, and I love guys that can throw fire, but he couldn’t throw a strike. Then when he did, boom, home run. He is a good pitcher, but he needs a change of scenery or a new pitching coach. Someone who can nail his pitching style down in a different way so he can be a more reliable man on the staff. Honestly, we needed a catcher that can hit. 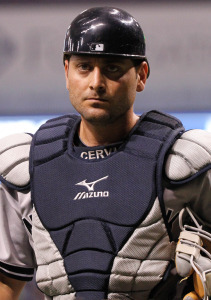 Cervelli may not be a durable guy, and he might have baggage, but who care about his baggage? If he can hit around .290 like Martin did, and come in in the clutch like Martin did, we will literally be getting a new Russell Martin. I think Cervelli will prove himself like Harrison did last year. Harrison said he wasn’t surprised with his performance because he always played like that. When you don’t know if you’ll play each day you play a different game. So when I got to play everyday I got to play how I used to play. I think Cervelli might have a break out year. Just think about the history of Yankee catchers coming to the Pirates. Their bats come alive for some reason. I truly think the Bucs have the best team even without Martin since they last went to the World Series. They have all around young talent, then some experience where its needed. This is the formula for a World Series team. Call me crazy but I think we can at least make it to the World Series this year! Mark my words. Ill be back in October to either eat my words or post a smiley face. I like Cervelli. Sorry to see him leave….. I guess the Pirates need a catcher to warmup the pitchers in the bullpen, right…right??? Well the Yankees had a logjam at catcher. I’m guessing this clears the way for John Ryan Murphy to be the backup in 2015. I know Austin Romine’s out of options, but I wouldn’t be surprised if he clears waivers. My favorite player just got traded for my second favorite player. Id like the Pirates to try and trade Tony Sanchez to Colorado and bring back the fort Michael McKenry to backup Cervelli.